Finally! A whole bag of pineapples!! These are my absolte favorite, so I was so happy when they decided to release them as just a whole bag all on their own! No more picking through the mixed bags to get these out, now I can have my own bag all to myself! Love a quick treat when we are out cycling as a family and these give us a great pick me up. They have a lovely flavour and we all like them. Nice and soft. I absolutely love these pineapple lollies. They are absolutely delicious and such a great treat. If I had to choose one lolly to have it would be this. Another great flavour range from this brand. Wow its great to be able to buy a whole packet of just pineapples. Yum. I have to restrain myself from devouring the whole pack. Great taste from a great company. Omg Allen’s Pinnaples never last long in our house hold. They have a great flavour and taste even better when been in the fridge eaten cold. These are one of those special treats that our family enjoys just for fun. They’re colourful, sweet, fun and exciting. A great treat for family time. Which child or adult doesn’t love eating pineapples. The whole family scoffs these lollies down. They are delicious, great shaped exactly like pineapples and perfect to keep the kids quiet or get them to finish homework before receiving some. Allen’s pineapples are a favourite lolly to buy and share,lovely to mix them up in a large bowl for a party,a soft and delicious lolly! Right size, right texture, right taste. I usually buy the party mix plus a bag of pineapples and mix together. Means I get enough pineapples with some variety. How could you not love Allen’s Pineapples. They were always my favourite as a child when I would buy mixed lollies at the corner store. Now as an adult I love to get a pack of these and will happily munch through the lot on my own. Allen’s pineapple lollies are sweet and yummy and I like to use them for decorating cupcakes. They are the perfect lollies for themed parties and birthday cakes. Really nice pineapple with a bit of a gummy texture which I find appealing . I also find they are quite light as a treat and doesn’t spoil your appetite and not too sweet on the tastebuds. A nice tropical treat in a lolly . 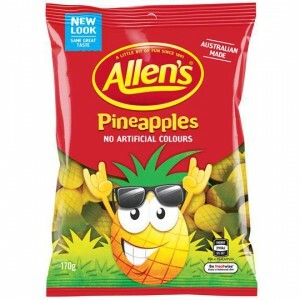 How would you rate Allen’s Pineapples?